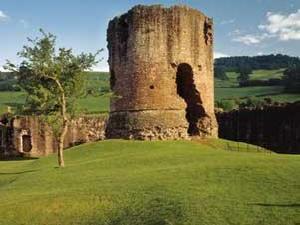 One of the 'Three Castles' held in common ownership, with Grosmont and White Castle. A circular keep dominating a rectangular ward, with a round tower at each corner - constructed by Hubert de Burgh probably between 1219 and 1232. Daily 10.00am - 4.00pm. Closed 24, 25, 26 December and 1 January. A465 north from Abergavenny & right onto the B4521 to Skenfrith; signed to the left when you reach the village.